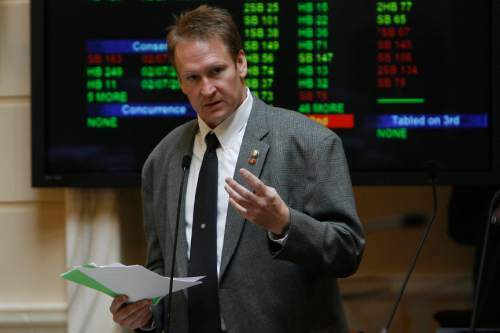 Chris Detrick | Tribune file photo Sen. Mark Madsen, R-Saratoga Springs, proposed establishing a network of marijuana greenhouses and dispensaries in Utah to be used for medicinal purposes. The bill failed by one vote in 2015. The intended audience is clear from the start of a new medical marijuana promotion video by state Sen. Mark Madsen. "My name is Mark Benson Madsen," says the Saratoga Springs Republican, grandson of Ezra Taft Benson, 13th president of The Church of Jesus Christ of Latter-day Saints. "My grandfather was my hero and my friend long before I knew that he had been the secretary of agriculture or was a member of the Quorum of the Twelve Apostles," Madsen says. Madsen&apos;s bill proposing medical cannabis failed by one vote in the Senate this year, and he knows he&apos;ll need to appeal to conservative Utah Mormon voters and his colleagues in the Legislature to support the measure next session. The video is the latest in a series produced by the Drug Policy Project of Utah and posted on the Internet&apos;s most popular site for stories about people who have tried medical marijuana, Illegally Healed. That group&apos;s Facebook post about Madsen&apos;s video had nearly 250 "likes" within 18 hours of posting Monday afternoon. Benson, the LDS Church&apos;s prophet from late 1985 to spring 1994, was an arch-opponent of communism and what he called "creeping socialism," serving as agriculture secretary in the Dwight D. Eisenhower administration from 1953 to 1961. "He was a great mentor," Madsen says on the video, "and taught me about individual liberty and individual accountability and the principles that underlie the proper role of government." In February, as he was preparing to introduce his legislation, Madsen traveled to Colorado to use legal cannabis products there. He has back injuries from playing football and an auto accident when he was young. He has tried most every kind of treatment. On the video, his wife, Erin Madsen, tells of finding her husband "cold and clammy," gray and not breathing, after he overdosed on Fentanyl, an opioid painkiller one summer day. He had been wearing a patch with a reservoir of the drug, and it had ruptured, flooding his system. "I was terrified," Erin Madsen says. "I had four young children and I thought my husband was dead." Mark Madsen was rushed to a hospital and treated for his overdose. That episode began Madsen&apos;s quest for a better treatment. He says doctors he consulted around the United States suggested cannabis. Eventually, Erin Madsen also came around on the issue, saying in the video that much of what she knew about marijuana was false. Unlike opioids, she says, "You can&apos;t take your cannabis and accidentally die." Laws against the use of medical cannabis, Madsen says, "are inconsistent with the principles of freedom I believe in." "I am concerned about my immortal soul. As long as I am not committing a sin in the process of doing this, then … I&apos;ll let my principles take me where they may." Madsen&apos;s is the fourth video posted so far by the Drug Policy Project, a nonprofit that&apos;s advocating for the legalization of medical marijuana. The first features Tenille Farr, a Spanish Fork mother with Hodgkin&apos;s lymphoma. The other videos feature Christine Stenquist of Kaysville and Forrest Shaw of Salt Lake City.